Thank you to Crocs for sponsoring this blog post. Please click here to learn more about Crocs’ new Back to School line. I was selected for this sponsorship by the Clever Girls Collective. All opinions expressed here are my own. And when I add three kids to the mix, it’s even more fun. No, I don’t love it because it means that the kids will soon be in school for hours each day leaving me with tons of daylight work time after a summer of late, late nights and barely-made deadlines. Sure, it’s nice to feel a little more rested, I won’t lie. But that’s not the reason. 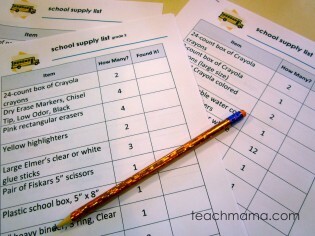 Why so I love school supply shopping with kids? Because a few years ago, I chose my attitude, a la the FISH! Philosophy and decided that instead of making shopping with kids a stressful, anxiety-filled time, I was going to make it a really enjoyable, exciting, and fun time. Believe it–and no eye-rolling, please. I decided that I was even going to make shopping with kids a learning experience–and helping Maddy, Owen, and Cora develop early literacy and math skills along the way. It wasn’t easy, don’t get me wrong–and some trips are better than others, for sure–but with a little prep, a bit of planning, and a big dose of positive attitude, shopping with kids–especially school-supply shopping–really can be a fun experience. 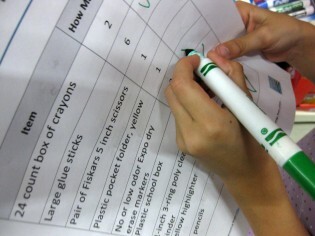 Why I love back-to-school shopping: A long, long time ago, when Maddy was five, Owen three, and Cora two, I made sh0pping lists for them to use as we grocery shopped. Nothing fancy–just a simple Word doc with words and pictures. I’m sure I did it during a nap time when I should have been doing dishes or folding laundry. I printed them out, gave them to the kids, and voila!–they had a focus as we shopped, a goal, a reason to be in the store, attentive and a part of the action. Maddy crosses an item off of her list last summer. 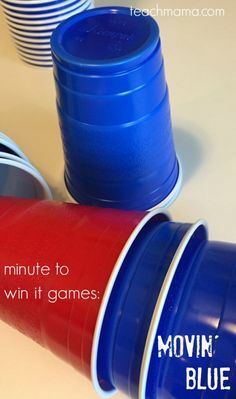 Little shopping lists made the whole experience more like a game than an annoying errand for the kids, so I did it more often than not when I had all three kids at the store with me–which was . . . more often than not. Before I knew it, I had three kids in school: Maddy in elementary and Owen and Cora in 3-day morning preschool. And school supply shopping had to be done for everyone. The Bag: With so many reusable bags in our house, there’s more than enough to go around. Each child chooses two to use during the shopping trip. The Event: We plan, we plan, we plan. We put a date on the calendar, and that’s our School Supply Shopping date. We get dressed and out the door early, lists and bags in hand. The Preparation: Even though they’re on the young side yet, I save Su nday circulars the week before we shop and have the kids compare their lists to the sales. We circle what we need and plan our route accordingly. This year, I plan to have Maddy do some comparative shopping–determine which store has the best prices–and help plan our morning. The Day: It’s a whole day event–ending with a lunch out on the town. Last year it was Burger King. This year, maybe we’ll hit the Golden Arches or Chick-fil-A. We’re not breaking the bank on this. 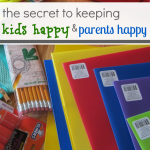 The Attitude: Though I want to cry each time I do this, I try to stay upbeat, excited about the prospect of my kids using their shiny new folders and brand-new erasers. Inside, I’m weepy and blue that my babies are getting older and will soon be in school for so much of the day, but on the outside, we’re talking about new teachers, new friends, new smocks, and an exciting new year. And that’s it–just a few ways we celebrate the new school year–and some super-sneaky literacy and math learning along the way! fyi: Crocs sponsored post as a campaign with Clever Girls Collective. Though I was compensated for sharing my Back-to-School thoughts, Crocs or Clever Girls in no way influenced my opinions here. I like your lists! School doesn’t start here for almost a month, but it drives me nuts that our school won’t send out back to school shopping until a week before classes start!